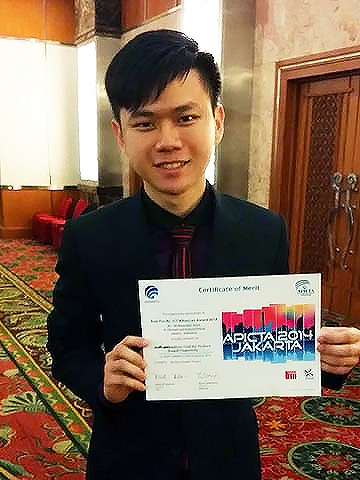 UTAR alumnus Goh Wen Bin bagged the Merit Award in the International Asia Pacific ICT Alliance (APICTA) Award held in Jakarta, Indonesia, from 28 to 30 November 2014. Goh won the Merit Award in the Tertiary Student Project category for his Final Year Project (FYP) titled ‘Authentication Tool for Picture Based Passwords’. The competition, which took place at Bina Nusantara International University, required participants from different countries to present their projects to assigned judges from Indonesia, Australia, Thailand, Brunei and Taiwan. The award presentation ceremony was held at Grand Sahid Jaya Hotel on 30 November. Goh had previously won the Merit Award in the same category in the MSC Malaysia APICTA. As winner at the national level, he was chosen to represent Malaysia in the International APICTA. He added, “I would recommend students to participate in various competitions using their project to gain more exposure.” Goh had previously participated in the FYP Competition and Hilti Excellent ICT Project Award held at UTAR.